When does it all make sense? – Multipassionate! I’m just reading an essay by Scott Dinsmore, founder of “Live Your Legend” in which he talks about the secrets of finding and doing work you love. His first, and one of his most important pieces of advice is to just do something. It doesn’t matter too much what it is, just do something. Remember that old proverb, “A journey of a thousand miles begins with a single step”? That step may even be in the wrong direction, but it’s still more useful to you getting on your path than a step you never take. I work with middle school kids, who are subjected to all kinds of standardized testing. I tell them all the time that guessing at the answer is still better than leaving the question blank. A blank is always wrong, a guess at least has a chance of being right. And in life, guessing wrong still teaches you something. At least now you’ve eliminated one way that won’t work. People chided Thomas Edison for spending so much time trying to create the electric light bulb. “Thomas, you’ve failed a thousand times, why not give up?” Edison would reply that he had learned a thousand ways NOT to make an electric light bulb. The path was getting truer all the time. 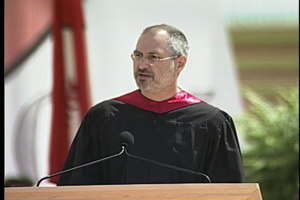 Scott often quoted Steve Jobs, and watched his commencement speech at Stanford University at least once a year. He inspired me to see what I could learn from it as well. At the beginning of this article, I quoted one of my favorite pieces of wisdom from Steve Jobs. Often, you have no idea how this experience, this mistake, this triumph will fit into the overall picture of your life until later; sometimes much later. When I first went to college in 1973, I had no idea what I wanted to be when I grew up. (Actually, I still don’t. Nor am I really certain I want to grow up.) I took classes in all sorts of different subjects, and I discovered a love of writing. When they forced me to choose a major, I chose journalism, though that did not turn out to form a major part of my future career. However, I’ve used the skills I learned in dozens of different endeavors in the ensuing decades. None of the random things I learned then, or since then, have been wasted. I have found value in virtually all of my disparate interests. Each began with a single step, reading a book, talking to people, trying to do something I’ve never done before. But if I never took that step, I’d never have discovered the value of what had gone before. I’ve read Paolo Coehlo’s compelling story, “The Alchemist,” a couple of times now, and I must admit, it scares me every time. The main character follows his dream without ever knowing what will happen or how he will end up. I have much more of a fear of doing it wrong than that shepherd boy. My responsibilities loom before me, asking me how I could meet them if I change my path. It’s a big question. How do you answer that question? Love to hear your stories in the comments.